Some artists are just so unique that it's hard to pin them down or make some kind of comparison to them. 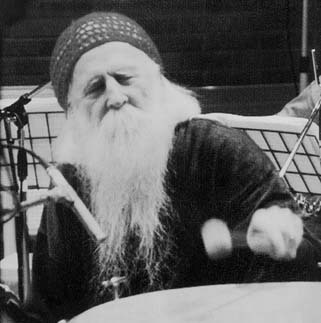 Louis Hardin (aka Moondog) is just this kind of artist. He's been active for over a half a century with everyone from symphony orchestras to Janis Joplin and Julie Andrews (yes, the actress!) performing his work. His work includes orchestra and small combo compositions, poetry, theology (as you'll see below) and theory- his latest release is the wonderful Sax Pax For A Sax (Atlantic). As he notes, because he works with more tonal (or traditional or melodic, if you want) structures for his work, he's some of an outcast and an anomoly. The closest analogy might be Cecil Taylor- a classical-minded composer who's drawn to jazz (or vice versa). No, that still doesn't explain away someone as complex as Moondog so maybe it's best to read on and let him explain for himself. PSF: With Sax Pax For A Sax, you've said that Charlie Parker was a big influence on the music. To me, it sounds more like big-band swing though. I'm into swing. I get that from the American Indians like the Sioux, the Arapahoe and the Apache. They have this drum-beat, heart-beat. Bom, bom, bom. They had the walking beat, which is slower, and the running beat, which is faster. I used that almost all the time on this record. I claim that swing came from them. If you listen to Indian music from the plains, you'll hear that there's a steady swing beat and the big tom-tom is syncopated with swing-type melodies. I got that influence when I was six-years-old in Wyoming. My father took us to an Arapahoe Indian reservation. The chief let me sit on his lap and let me beat the tom-tom for the Sun Dance. So, that goes back to the early '20's for me. PSF: You're talking about drum rhythms here and on that album, it seems like a lot of the music is based on that. The beat is always in the background. I sit down at my desk and write as I get different ideas and phrases. I don't compose at a piano, it's mostly in my head. The classical masters, like Mozart and Hayden, would sit at their desk and write a string quartet like somebody would write a letter. They're trained that way and it's the best way to write because you're not limited by your technique on an instrument. 95% of my music is done that way. Sometimes I test things on the piano, if it's a complicated rhythm or a harmony. PSF: How did the Sax Pax project come together? They recorded it in Bath, England, mostly London musicians. We had been doing some concerts before so we had some music at our fingers and then we just put it together. Sax Pax is a play on the word 'pax,' meaning peace. Ironically, the sax was invented (Adolf) Sax to, what some would saw, compete with the brass in military bands. So 'peace' and 'military,' that's a little play on words there. The oboes and flutes wouldn't compete with the trumpets and trombones in a military band. But the saxophone is very loud though it's been abused and misused a lot. Made it sounding almost comical at times by jazz musiciains but it has a serious side too. A lot of the jazz and rock did abuse the saxophone as far as I'm concerned. I think I gave the saxophone a better deal. It can do very noble things. PSF: You've spent over a half-century as a composer. What's kept you motivated to work? It's just a desire and an urge to write. I like to compose music, it comes very natural to me. I write a lot of verse too. I have more ideas than I can use. It takes a lot of time just to develop one idea. Ideas come very fast and easily for me. PSF: What do you draw inspiration from for your work? Silence mostly. I find a quiet place where I can work. That's why I do a lot of work at night. Being in Munster, I have more peace at night though there's a lot of bell ringing here. I like bells but my god, they really go at it here. I also hear all kinds of sirens too but they all sound the same. When I was in New York, you could tell the difference but here they all sound the same to me. Ambulence, police and fire all have the same siren. When that's going on, I can't work because that interferes with my thinking. PSF: Are there any composers or musicians today that you see as being your peers? I'm not in the field of atonal music at all. I'm strictly tonal so I feel kind of lonely. That seems to be the big thing now and I have to close my ears to that because it's far away from tonality. That's the big thing for me, tonality. I find that a lot of pop music is (though I don't agree with how they use it) tonal. They use the basic one-four-five harmonies and at least that's tonal. When it comes to the rules of counterpoint, they don't pay any attention to that. That's my big forte, to follow the basic rules of counterpoint. Everything on that album is pretty counterpointal. PSF: Outside of pop or jazz, are there any composers that are favorites of yours? I listen a lot to Bach, Beethoven, Brahams and Mozart. When I was a very young boy, I lost my site and I was at a school for the blind. I heard my first classical records. One was Tchaikovsky's Fourth, Beethoven's Fifth and things like that. We had a school orchestra and we played some Mozart and we played some other people like that. I got to hear quite a bit of music then and then a lot more later on recordings and radio. PSF: Your parents were missionaries. Do you think that might have had an effect on your work? As far as religion, I went along with what they said. I didn't know any different until I was in my late teens. My sister began reading a lot of philosophy to me and that undermined my belief in Christianity. The Greek thinkers and Pythagorus had a big influence on me. Shakespeare had a big influence on me and I was impressed with what Newton did. Then I gave religion up completely. That Christian influence didn't last very long. PSF: Pythagorus was also very interested in music. His basic rules of tone relation are the basis of counterpoint. I follow those very religiously. Those are physical laws of the universe which cannot be altered- that's the way they are and the way that tones and scales are put together. PSF: Another lasting influence from your childhood seems to be nursery rhymes as you've done some recording of these. I was approached by Julie Lawrence to do the music for the Mother Goose album with Julie Andrews and Martin Green. That's how I got into the nursery rhymes. It was nice working with Julie. That was before she became a star in MY FAIR LADY. I only got into it because of that record. PSF: Part of your hertiage is Scandanavian. I know that for a while you were wearing a Viking costume. Was that a way for you to show pride in your heritage? It started out differently. When I first got to New York and I was attending rehearsals of the Philharmonic, they wrote me up as 'a man with the face of Christ.' I put up with that for a few years, getting compared with a monk or Christ, then I said 'that's enough, I don't want that connection. I must do something about my appearance to make it look un-Christian.' At that time, I was studying the Norse and I felt much closer to that than Christianity so I'd do something to make it look more Nordic. That's what was behind it. PSF: When you were first in Manhattan, you were performing on the streets. Why did you decide to do that rather than working in a club or hall? I made my living that way and I got exposure. It really worked because I hadn't been on the streets for more than a few weeks of the fall of '49 when I was written up. By January of '50, I was sitting in the doorway of Spanish Music Center on Sixth Avenue (which isn't there anymore) owned by Gabriel Oller. He said 'I like the music you're making. I made records. Would you like to make some singles?' We did three singles together and then I got other offers including a Columbia album. The first one was with a forty-piece orchestra that (producer) Al Brown got together. He really did a lot for me. PSF: At that time, you got to meet Arturo Toscanini and Leonard Bernstein also. It was strange about Lenny. I came to New York in November of '43 and the next day, I went to the Sunday broadcast at Carnegie Hall. I wanted to sit right in front, not realizing that Bernstein was making his debut. Within a few feet, he was standing there and I thought 'I'm going to be the first one to applaud' because I knew it was going over coast-to-coast. I didn't know I was giving him the first clap of his coast-to-coast debut. Joseph Shuster was playing the cello solo in DON QUIXOTE and he saw me. A few days later, I was standing at the stage door entrance and the man there said 'you're not getting any farther.' There was an open door leading to where the musicians where and they were taking a break. Joseph came over to me and said 'I saw you Sunday, would you like to go to rehearsals?' He came back with (Artur) Rodzinski, the conductor. He took me and said 'you sit here and enjoy yourself.' So, for years, I was allowed to go to all rehearsals. I talked to Bernstein later and I told him about all of that. We got very friendly. The last time I met him was in Sante Fe, New Mexico. He was having his shoes shined and I was out on the street. He said 'what are you doing in Sante Fe? I'm on my way to Israel.' It was 1948, just when they were forming the nation. Rodzinski introduced me to Arturo Toscanini. I was so impressed that I bent over to kiss his hand. He pulled it away and said 'I'm not a beautiful woman!' (laughs) When they left, Rodzinski said 'Louis, remember this.' And a few years later, they were both dead. That was at Madison Square Garden where the NBC Orchestra and the Philharmonic did a joint concert together. Over a hundred musicians there. PSF: It's amazing that in such a short amount of time, you went from playing on the streets to having symphonies perform your works. Was that a dizzying pace for you? PSF: You're spent a lot of time writing about and working with canons. What's your fasincation about this? It's the interplay of one part against another but the parts must fit. When you write a piece, it may take a day to write it but then, composers, especially Bach, would put it aside and say 'it's finished.' But that's when my work really begins. It's note by note and in a sixteen part canon, there's 120 possibilities of making a mistake between any two notes. That's the most boring labor you can imagine, comparing note against note for a whole composition. If you find a mistake, you can't just change the note, you have to change the whole phrase because of the musical grammatics. My music on this album (Sax Pax), there's not one mistake in there. I use it on a lot of other things too. One other thing I like about canon is that you start with one voice and then you add first counterpoint, then the second and so forth. If it's a nine part canon, then you have this build-up which leads up to a climax. Harmonic music doesn't do that- they start out full blast and goes on. But this builds up and builds up. That's what I like. A lot of people like that effect of the gradual build-up. PSF: I've heard that you've also had special instruments made for your work. Yes, I had a cabinet maker in New York who had built instruments for me. I'd give him the specifications and he'd do a beautiful job on it. For the street playing, I needed a special kind of drum down close to the ground. I didn't have a chair there so I'd just squat down and played. I had them specially built on a triangular shape. First I had square drums but I liked the triangle shaped better- I called them trimbas. Then I had a little harp that I played with my left hand. I'd beat the other drum with a maraca. PSF: You've called yourself a 'European in exile' and you'd lived in Germany for about 25 years. What's drawn you there? I feel culturally and artistically closer to Europe than I do to America, although I was born there and I have fond memories of America. Especially Wyoming where I lived on ranch as a boy and had my horses. I was hunting and trapping and fishing. But New York has a big hold on me too. Europe is where my heart is, artistically with all the composers who have worked here and all the historical things that I've read about. It's very fascinating. PSF: This is an interesting quote from you: 'rhythmically I'm in the past. Melodically and harmonically, I'm in the present or avant-garde.' What did you mean by that? 'Rhythmically in the past,' that goes back to the Indians. Even counterpoint comes out of the past. It's goes back to 1100 or 1200. Harmoncially, my music is the same as Bach and Beethoven and Brahms and those people. No difference really. Rhythmically, it also goes back to the past- the swing rhythms of the Indians. You really couldn't find anything more syncopated. If you get a chance, listen to some Sioux Indian recordings or Cheyenne or Blackfoot Indians. You see how syncopated their rhythms are. PSF: You're putting together a book of poetry now, right? I started writing couplets in the '50's. First, there were seven foot, which what's called iambic septameter. The normal couplet is iambic pentameter but those lines are too short to get my ideas out. I've written a lot in nonameter, which is nine iambic feet to a line. PSF: You're also working on Overtone Tree? That's one of my symphonies that I've been working on for twenty years. I finally got it finished now. I've been doing a lot of other work but this is a major work. I don't expect that it'll be ever played. It'll probably be buried with me. It's written for four conductors- one main conductor and three assitants because at one time, there may be as many as sixty or seventy parts going and one conductor can't hanlde that. It's all counterpointal. So each conductor would have his own score and be in charge of a certain section of the orchestra. It's based on the first nine overtones and I tried that as a theme in '73 on the northwest corner of 55th Street and Sixth Avenue- that's where I got the idea to use overtones as a theme. After I worked on it, I went to Europe. I was in Hamburg in '75 and I was working on the overtones and I finally realized that I had something interesting here. It was a code. I didn't know it was a code but I cracked the code and found out how to develop it. Ten years later, I found out what it was. I wasn't looking for a code. That code proves that not only whoever created the universe does exist but he, I call him the mega-mind, wants us to know he exists. Within this code, it also proves that contraction must come before expansion. It also proves that a cause can become an effect and an effect can become a cause. It proves the two-directionality of time. It proves that the past is the future and the future is the past. All this flys in the face of what Hubble did, saying that there was a big bang and an expansion of the universe. His is a theory but mine is a fact. A fact incontrovertable, as I call it. They talked about these theories of mine on National Public Radio. PSF: Are you planning to tour and do performances again? There's nothing that I'd like to do more. I have a 26-piece big band in England. They appeared at the Queen Elizabeth Hall, Elvis Costello put it on in '95. We got great reviews. I got great musicians- you can't imagine how great these guys are. They cost so much so I haven't got any work. It's such an expensive bunch. It's the Saxophonic plus the London Brass, they're world famous. They liked me very much and they said 'we hope we have the chance to work with you again.' But it would cost about 50,000 to bring them over. At least we made a recording of it. And now Moondog turns the tables for a theological discussion. MOONDOG: I have a question for you. How do you feel about Christianity monopolizing the passing of time, when the Pope and the Church decided to stop the old Roman calendar of the Caesars and start all over again? How do you feel about how every religion must march to the Christian calendar? MOONDOG: I know but how do you feel about it? JASON: I've always thought that it was pretty crazy that we had to decide to carve up time into such exact pieces. I never cared much for the Pope or the church. MOONDOG: Well, I'm starting it all over again, going back 10,000 years, into the Ice Age or the Inter-Glacial Period when farming and civilization began. Starting there a new calendar. So by the time that Christ was born, it comes to (the year) 8001. This year will be 9998 and next year will be 10,000. All the numbers are going forward for all religions and, here's one for you, Chirst was born 5 B.C. so his date would be 8996. I don't know an exact date for Moses but he's figured in there roughly. I can't find a date for Abraham though. But I'm putting in things like that. JASON: That might be tough to figure out. They didn't always keep the birth certificates on floppies back then.